This stunning eyeshadow palette is my must have from now on! Great quality for an affordable price! The palette has a peculiar duochrome pigment, which is a dupe for MAC Club. I came across this beautiful palette while surfing the online drugstores. To tell you the truth, I bought the palette mostly due to this duochrome pigment that reminds me of the MAC Club. Other than that, I have an abundance of similar shades. As a result, however, I am really excited about them too, as the texture, quality and application are on top! The palette comes with a two-sided applicator of awful quality I’ve thrown it away at once. The product contains 8 gorgeous and versatile shades suitable for any occasion. I’ve picked up the palette called Comfort Zone. The left quad is beige, gold and brown. The first shade is good for highlighting the brownbone and the inner corner of the eyes. Plus, it can be used as a base color on the whole eyelid. The second shade is peach with a hint of rose. It can be used as a base color. The third shade is beige and gold. 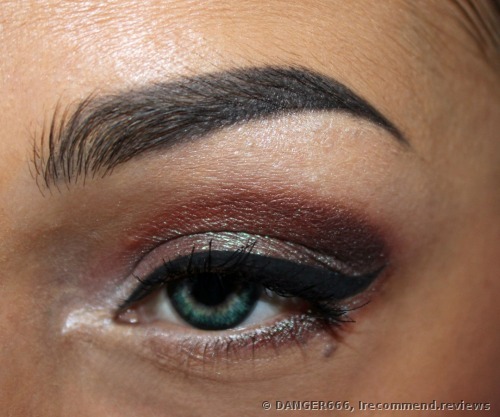 It’ll look good both as a base color and together with darker shades in the outer crease. The fourth shade is dark brown with a lot of red and golden glittering particles. It is perfect for darkening up the outer crease. The swatch delivers the real color. The second quad is beige, gray and green. The fifth shade is gray with a hint of gold. It looks good as a base color. It’s not suitable for the browbone, because the shade is too dark. 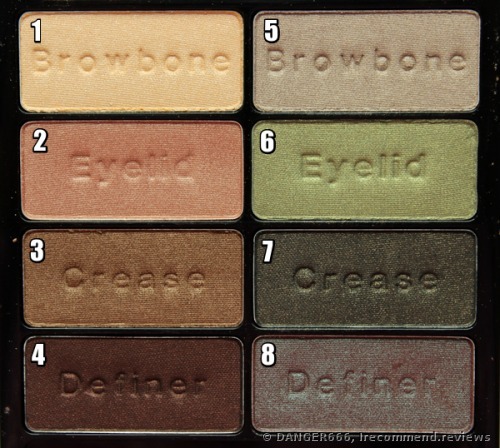 The sixth shade is a delicate green tone that looks great on the eyelid together with the 7th shade. The seventh shade is dark green with a lot of golden shimmer. It goes perfectly with the previous hue. The last one is the most gorgeous tone out there. This shade was the reason I purchased the palette. It is a dark red, brown, green and blue shade! Such a complicated color! I apply it to my eyelid on its own, as it looks awesome without any other hues. The SWATCH shows the true beauty of this stunning and amazing shade! It looks fabulous in a makeup! Due to the tricks of the light it seems that I’ve applied one shade to one half of the eyelid and the other shade to the crease. You’ll always be in the limelight with this shade on! Hey there! The palette Wet n Wild Color Icon in the shade E738 Comfort Zone compliments girls with warm undertones for the most part. Period of use: more than 3 months. The palette has 8 pretty big refills with all shimmers. Packaging : It’s made of transparent plastic. It closes shut with a click. 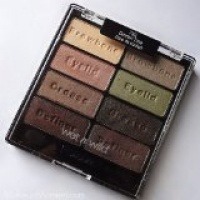 Cool and low-cost eyeshadow palette with beautiful shades. AM/PM makeup? Easy! Hello! After reading and watching great reviews about the Wet n Wild palettes, of course, I wanted to buy one. General information Nt Wt - 8,5 g Made in China, the brand country - The USA The way it looks Plastic palette with translucent top. Pathetic eyeshadow. Looks great in the tube and awful on the lids. Swatches and my attempt to apply it.